Bixby makes sure you won't forget what’s important to you. Go beyond standard to-dos with reminders that include content like emails, texts, photos and links. 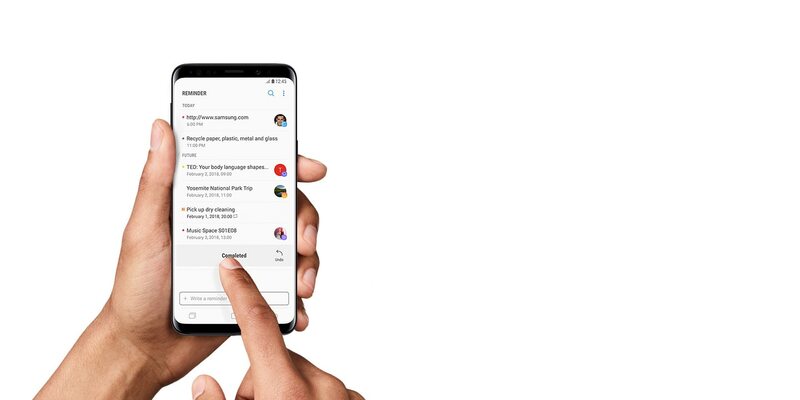 Bixby works seamlessly with your phone’s apps and share menu, so you can talk, type or tap to create a reminder. So if you say “Bixby, remind me to pick up milk, eggs, and diapers when I leave work," Bixby will promptly create a reminder and send you an alert when you get off from work. * Bixby only recognizes certain accents and dialects of English (UK), English (US), French (France), German, Italian, Korean, Mandarin Chinese, and Spanish (Spain). Other languages to be supported. Set Bixby reminders for content such as texts, photos and links straight from selected app with a share menu. From things you need to do on your phone, like remember to watch a video, to things you need to do, like get milk, you can keep your important to - dos in one place.